Coach Michael McLaughlin has called on the Ulster Schools GAA to be brave when deciding the future of Cathair Dhoire and other school amalgamations. 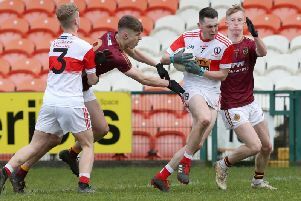 The Derry City team lost out to St. Patrick's Grammar, Downpatrick in Monday's Mac Larnon Cup final in Armagh but have faced criticism from a number of other schools who are unhappy at their inclusion in the 'B' graded competition. St Patrick's Tom Smyth tries to get away from Cormac Mooney of Cathair Dhoire during Monday's Mac Larnon Cup final. 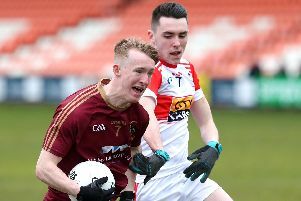 The debate will be opened again when the Ulster Schools sit down to assess this year's competition and according to McLaughlin, Cathair Dhoire's future is likely to be a hot topic of discussion. "The future hangs on whether Ulster Schools GAA come up against fierce opposition to the project," conceded the St. Columb's College teacher, "As you can imagine, I have been told once or twice along sidelines this year that over someone's dead body this will continue. "Schools football has to be about the boys. It is not about coaches or anything else. Coaches in other schools have to allow these boys to play Gaelic Football. Denying them that opportunity would be shameful. "I can appreciate why people would be annoyed by the project but we are not running around hammering anybody. In every game we played this year, had I been an opposition coach I would have thought, 'Yes, they are beatable' and that has been proved in the final. "Red High had a good look at us. Maybe the difference is the Red High coaches have watched us all year. They were in Celtic Park twice, they came to the Castlewellan game, so they had an eye on us and maybe their their preparation was better than ours. If other schools coaches do the same, of course we are beatable. "Some people just run around with this fear that it is 'Derry'. It's not Derry, it is Derry City. People keep saying St. Columb's has 1,400 boys. It does but only 100 play Gaelic football through the school. The future will all depend on the opposition. I know Ulster Schools, I know they are happy and want to see lads developing so I'm hopeful they will help me to keep pushing these boys over the line and get them playing a higher standard of football." "Logistics are the big thing," he explained,"You would like to be working three days a week with the boys as you would be with a school team. "They are great guys to work with. Look what we got out of them on one day a week, it is phenomenal. These guys have achieved this with only one day a week. Our kick-outs today worked well but that was after only one session when we laid a kick-out plan down. It worked well for us but the tide eventually turned. "Moving forward I would like at least one more day but I know that is logistically very difficult. "I'd like to see Cathair Dhoire appear in Third Year as well. Then you would have a team coming from Third Year through, playing with each other in two competitions before they get to their sixth year. I think that is the only way to get up to Mac Rory, having them playing together further down the school. "This project has legs. I think after this year people will appreciate what it is we are trying to do. If everybody continues to weigh in behind it, then Derry City can become another platform for young school players to improve themselves. "GAA people keep going on about Derry City but we need more platform and Cathair Dhoire can be one of them." Looking at the game, McLaughlin said he was Red fully deserved their victory but admitted the city boys will rue a game in which they never quite clicked into gear. "We are gutted, absolutely gutted, more so because I felt we never really got going. We missed a couple of half goal chances, they won a lot of breaking ball and that gave them a platform. We were a bit jittery and I suppose that's the difference between training three times a week and meeting up once a week. "I couldn't ask any more of the boys, I never can. They went out and gave everything they had. Red High were clinical when they had to be clinical and that's why they won, I wish them all the best. "We have trained twice a week for the last couple of weeks but when you look at it on the day, it's just not enough but from the start, the whole point of this project was to give these boys this level of football. You can see they can compete at this level. "The fact that Ulster Schools allowed us to come in to the level, we are very thankful for. I would now be hopeful, based on what I have seen this year, that we are at Mac Larnon level next year. "I know people will look to see us thrown up to Mac Rory but you have to look at today and say, if we were playing Mac Rory Cup football we would get hammered out the gate and the whole project does on its knees. "So, yes, I would say that bit of consistency from Red High was crucial,. You could see their communication on breaking balls. You could see how they held the width of the pitch and came in off the lines very hard, that's five years of coming up through the school together. They deserved it. They did those small but crucial things better and were very deserving in the end."